Following an acute hospital stay, there are times when a patient may not be strong enough to return home. 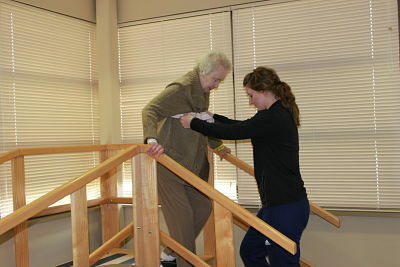 Certain patients can be eligible for a continuation of skilled services through a Swing Bed Program. Our Swing Bed Program, REHAB U offers patients the ability to remain close to home while gaining strength and independence to return home. REHAB U provides patients with a variety of skilled nursing services. Examples of skilled care may include: IV Therapy, Skin and Wound Care, Physical Therapy, Occupational Therapy, Speech Therapy, Respiratory Therapy, or Pain Management. These services are provided under the direction of a physician and provided on a daily basis. Each patient will have individualized goals to reach the highest level of independence possible. 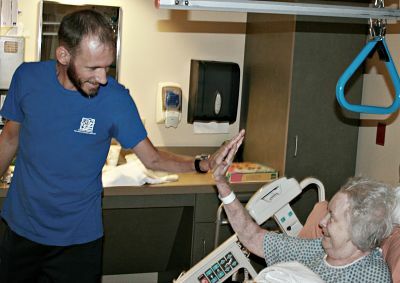 REHAB U, like other swing bed programs, is a federally-approved program that allows critical access hospitals, like ours, to use regular patient rooms to provide this special care. The doctor has determined a need for daily skilled care. A patient must be hospitalized as an Acute Care Inpatient for a minimum of three consecutive midnights within the last 30 days. Admissions can come from any hospital, including our hospital, after three consecutive midnights as an inpatient in acute care. You have Medicare Part A or other insurance with hospital based, skilled-care benefits and days available for skilled level of care. A patient stay will depend on the individualized care plan, progress of goals and dismissal criteria. The average length of a Swing Bed patient stay is 1-2 weeks, but can go up to 100 days in some instances. The focus of REHAB U is on improving your functional, nutritional, and medical condition. During your stay, our multidisciplinary team will collaborate with you to create a Discharge Plan and set functional and health goals. For further information about REHAB U, please call our Patient Care Coordinator at 620-325-8335.